Tuesday in San Francisco was a chock full day of work, standing and talking for most of it. So, when the five o'clock whistle blew, it was time to cool our jets with some tasty brews. We headed over to Thirsty Bear one more time to recap our day and prepare ourselves for Wednesday. This time it was a cask-conditioned brown ale (every Tuesday a new Thirsty cask on the bar) and another farmhouse ale. Perfect. Then for a quick change of clothes back at the hotel and my Lancaster County Correspondent and I were off to a new discovery on my Bay Area checklist, Beach Chalet Brewery and Restaurant. I know, I know...many of you will immediately knock Beach Chalet for their beers. Hold up, for a minute and listen in...especially, if you've never been to the edge of San Francisco. Beach Chalet is located on the western edge of Golden Gate Park, or the eastern edge of the Pacific Ocean, depending upon the direction from which you're looking. Doesn't matter, at Beach Chalet you get the best of both worlds---I'll explain in a few minutes or paragraphs, whichever comes first. The brewpub and restaurant are located near the end of the annual Bay to Breakers race, which leads runners on a course that traverses the city from the San Francisco Bay near the Bay Bridge to the Pacific Ocean. San Francisco is approximately 7 miles by 7 miles, top to bottom left to right---or north to south east to west. So, from downtown, it's close to a $20 cab fare to get to the ocean. Otherwise, choose from a couple of bus lines and a Muni line that will get you close. Your bicycle will get you closer. Enough of the geography lesson already, right? We arrived in plenty of time to have dinner upstairs at the Beach Chalet and to stay for a while afterward for beers and live music downstairs at the Park Chalet. At first, the difference in names doesn't make much sense. Once on site, it becomes perfectly clear: the restaurant, The Beach Chalet, is situated upstairs on the front side of the building so that diners can look out through large windows over the Pacific Ocean and the bar, The Park Chalet, is laid out so that customers can stroll in from the park paths to lounge on the lawn or come into the bar, where large windows give a view of the Golden Gate Park. Large adirondack chairs are strewn across the lawn where bar service is available. With this description and a couple of these pictures, you might get the idea that this is one of the most picturesque settings for a U.S. brewpub. You then, sir or ma'am, might also be correct-o. I can just imagine with an afternoon's worth of time, one could park at the brewpub, have lunch and a beer, take the bicycle out of the car and ride for a couple of hours through the park, then return to the brewpub to lounge on the lawn with a couple of drinks and munchies, before settling in for a dinner upstairs. 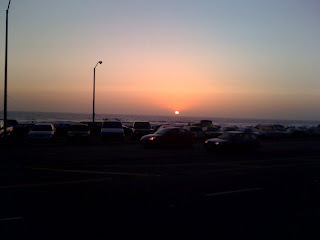 Catching the sunset over the ocean would be the perfect capping to a perfect day. Back to how our time was actually spent last week. As the saying goes, we got the lay of the land by walking around the outside and downstairs before settling in for some dinner upstairs. A couple of fish entrees for dinner seemed appropriate and the light jazz from the local musicians provided a relaxing atmosphere in which to enjoy dinner. The food was solid but not overly adventurous, most likely a perfect fit for catering to the mass market tourist crowd. The beers seemed to be in the same vein. While possessing some decent flavor, the body of the several beers that I tried were all a bit on the thin, or shall we say aqueous, side. Spritzy carbonation also seemed to be a common theme. My LanCo Correspondent made the comment that the wheat was one of the least tasty and interesting wheats he'd ever had; I couldn't disagree. Though, to be fair, the beers were refreshing and drinkable (especially over the course of an evening), yet nothing to write home about to my inner beer geek. But, like I mentioned at Thirsty Bear, every establishment worth anything needs to have at least one thing that differentiates itself. At Thirsty Bear, it's the Spanish theme that runs through the menu, music, and atmosphere. At Beach Chalet, it's the location (and probably location and location, as well) that provides the largest differentiating factor. To walk across the street from the Beach Chalet and be at the ocean (with a great view of Marin's Mt. Tamalpais in the distance), or out the Park Chalet doors and be in the park, all while being in one of this country's most interesting and dynamic cities and serving up at least average food and beverage with good service is to be in a very good business position. Speaking of drinking these beers all night long, after dinner we wandered down to the Park Chalet to see what the live music was all about. Figured we might have one or two more beers to round out our sampling. Turns out this was a very fortuitous move on our part. The brews were consistently fine and drinkable...the music was out of this world and gets my next plug here. Diego's Umbrella apparently plays the Park Chalet every Tuesday night and draws quite a faithful crowd. A Bay Area-based band of six, they play mainly West Coast and European gigs. The music brings sounds of Spanish, Rock, Ska, Middle Eastern, gypsy, and even a touch of Klezmer. In a nutshell, these guys know how to get the party started and to keep it going all night. We stayed long enough to catch their final set before heading off to our next stop. Toronado. Yes, Toronado...would any trip to San Francisco be complete without a stop at the Lower Haight's Toronado? Probably not. If you read around here closely enough, you know that I also throw Magnolia, less than a mile up the street, into that must-do pile as well. Good thing they're within walking distance of each other. At Toronado, it's all about selection. The atmosphere is fine, though when crowded it gets a bit uncomfortable for space. But, the service has always been a bit of a sore point for me. It can be a great beer bar (even one of the best in the country) for its selection, but it can't be the best (in my opinion) with indifferent, sometimes borderline rude, service. Take, for example, the poor soul who was summarily dismissed for not knowing the cash-only policy. Or the extremely rude response I got one time when calling to ask about an upcoming special event. Don't get me wrong, I don't need, nor want, to be pampered...just treated with a moderate level of respect and enthusiastic service. 'nuff said, I think, on that point. To the beer, of course. I obviously don't have much trouble finding good beer sold in my home market of southeastern Pennsylvania. The Philadelphia region has been very, very good to me, thank you, when it comes to great beer. But, to see so many good beers so casually served at Toronado is a thing of beauty. Dogfish is really hitting the market strong in the Bay Area since its introduction, what was it a year or so ago? Russian Rivers abound. As do Moylans, Marins, Iron Springses, Moonlights, Lagunitases, Bear Republics, 21As, Deschuteses, Anchors, and Anderson Valleys...plus enough Belgians to keep you interested too. So much fun to drink these as locals, instead of as imports to PA. After grabbing a couple of slices of pizza next door at Mythic Pizza (try the Athens with garlic, artichokes, and pesto) and putting back a couple of beers, we moved on to our last stop of the evening, Bourbon & Branch. A speakeasy-modeled bar, you must first get a reservation with which comes a password that you're asked for when you ring the buzzer at the non-descript entrance at the corner of O'Farrell and Jones in the city's Tenderloin district. Once your reservation is confirmed, you're shown to your table for drinks. No food is served here, just drinks...and lots of 'em. The menu is stuffed with cocktails of every concoction, including a handful of beers at the end of the menu if you must. But, we took a break here at the end of the night for a rye-based drink (me) and I forget what Dennis had. I'm no real connoisseur in the world of mixed drinks, but mine was pretty darn tasty with the sharpness of the rye and the pucker-inducing of the absinthe. 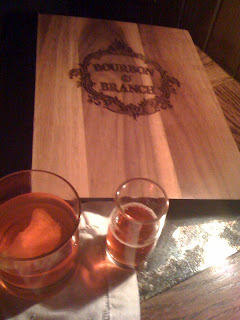 Not much else to say about Bourbon & Branch. It seems like the kind of place that's fun to go occasionally, particularly if you have friends in from out of town or if you're out on a special occasion. Once you're past the novelty of the front door, it takes on the feeling of being in just another bar. Apparently, there's a library bar (closed on this particular night) in the back which gives more of a feeling of speakeasy seclusion. Also, still-existing tunnels under the bar that lead you a block away are still there, though perhaps not in use...did not ask. That seems like about enough for this day's worth of posting. With so many of us taking the next few days as holiday time, this series of 6 postings from my week in San Francisco will resume next Tuesday. Part 4 will include my review of the Magnolia Brewery/Incanto Italian Restaurant beer dinner which was held at the restaurant on June 26th. My best wishes to all of you for a great weekend.